Simon Taylor, Senior VP & GM, System Software & Tools The future of work may not require office plans. As the new generation of workers doesn’t want to limit themselves to commuting and cubes, several trends— including BYOD and Enterprise Mobility—support a connected world where employees can work from anywhere will be the new norm. “A major part of creating such a connected world goes under the name Citrix. Comtrade has been with Citrix in this journey for over 10 years and has helped over 900 companies in their mission to achieve excellence,” affirms Alexis Lope-Bello, CEO of Comtrade Group, a global technology company with over 1600 employees. The state-of-the-art mobility platforms from Citrix are not only empowering employees to work from anywhere, but also providing full security, granular control and an uncompromised user experience that is helping nearly 330,000 organizations worldwide to stay ahead of the curve in the industry. “However, there is a catch,” says Lope-Bello. As Citrix significantly impacts the way organizations deliver applications, desktops, and enable workforce mobility, enterprises require sophisticated tools that can monitor these environments. “But, organizations have already made significant investments into their operations monitoring tools, and have trained their support staff to effectively use these tools,” he adds. This requires the new tools to not disrupt, but integrate well with organization’s IT operations strategy—an area where Comtrade performs magic. “Our management products are offered as software modules that natively plug into the existing monitoring platforms, and in the process enable full end-to-end monitoring across Citrix infrastructure and user experience. This unique approach enables customers to leverage their existing tools and quickly integrate Citrix into their IT organization, and at the same time, gain deep insight into Citrix service levels,” affirms Lope-Bello. “Furthermore, the use of plug-ins help our clients to perform quick deployment and simple upgrades. It also accelerates problem resolution, and works across physical and virtual appliances,” he explains. Comtrade’s unique blend of products and services are designed to support both technology vendors and IT professionals. ”Our business is based around two major areas,” says Simon Taylor, Senior Vice President and the General Manager of Comtrade’s System Software and Tools business. The first is the development of management products that provide both end-user monitoring and infrastructure management for some of the world’s most widely used technologies; while the other is product development services for system software vendors. “The two areas of our business help technology companies expedite their product roadmap and bring their own products to market faster,” he explains. 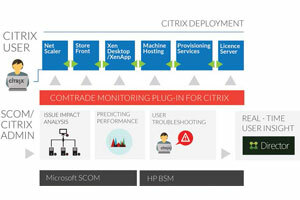 Comtrade’s end-user monitoring and infrastructure management products cover the entire Citrix product suite. “These management plug-ins allow every customer to see through their entire Citrix environment under one single pane of glass and be able to identify issues within the environment in a proactive manner,” affirms Taylor. “So, even before the end-users encounter any potential issues, IT is able to address the technical challenge,” he explains. Comtrade management products enable organizations to take advantage of the capabilities and confer to the standards of these monitoring platforms to help IT organizations deliver exceptional service levels, while keeping operating costs under control. “No Citrix competitor delivering mobile workspace solution has such deep end-to-end integration with the leading enterprise monitoring platforms,” affirms Taylor. Comtrade’s customers are some of the world’s most renowned businesses spanning a number of industries, including government, financial institutions, healthcare, telecommunication providers, high-tech vendors, and SMBs. For instance consider the case involving UK’s leading cancer research charity, Cancer Research UK. The client implemented Citrix XenDesktop to give its business units the opportunity to work anywhere, and to support these initiatives with a stable set of business processes. After the investment, the client needed a monitoring solution that could handle the power and complexity of XenDesktop. Simultaneously, they were also in search of a solution that could detect issues with desktop initialization, optimize desktop pool settings to handle the morning log-on busy times, and prevent outages that could harm the business. “Comtrade Management Pack for XenDesktop was the only logical solution of choice,” says James Doyle, Manager of Core Infrastructure and Microsoft Systems at Cancer Research UK’s IT Services. With Comtrade MP, Cancer Research UK was able to manage everything from one console—virtual, and physical environment, from end-to-end. Now the charity’s IT staff also have a complete overview of the entire IT infrastructure, enabling them to identify the source of any problem, resolve it immediately and minimize the impact on the end-users and their business units. One of the major attractions of Comtrade’s management packs is its in-house alert mechanism, which flags an alert whenever Citrix availability is impacted or service levels are not optimal. “Alerts contain explanation of the underlying issues, as well as advice on the ways to resolve them. And it helps resolve issues on first or second support level without wasting the valuable time of Citrix experts,” says Taylor. “For instance, one of our customers was able to resolve 80 percent of their Citrix support tickets on 1st and 2nd level using our solution.” The other key advantage of these products is their ease-of-use. “If you know how to use the enterprise management platforms from HP or Microsoft, you already know how to operate our solutions,” claims Taylor. Going forward, Comtrade aims to be the ‘Go-To’ partner and a key innovator in the IT space. The company is on the verge of making a marked shift towards Cloud Management. “We are looking at ways to develop more intelligent management packs that can be leveraged within other areas of Microsoft System Center. This will enable the client to obtain all of the information that they need from the cloud and actively monitor and manage their environment,” reveals Taylor. “We have invested heavily in ensuring that every time Citrix comes out with a new product, we offer a monitoring plug-in that will connect into the enterprise monitoring platforms. As an example, when Citrix launched XenMobile, we immediately put resources on the development of XenMobile Management Pack to connect into Microsoft System Center Operations Manager. This duality and synergy have led to a highly trusted relationship between Comtrade and Citrix. There will also be higher levels of focus on synthetic transaction monitoring and Application Performance Management (APM), so that we can leverage the benefits of the cloud and still support clients’ Citrix environment,” he concludes. Editor’s Note: Since this interview first appeared in early 2015, Citrix announced it has acquired Comtrade Software’s SCOM Management Packs IP. Comtrade Group is a leading technology company with over 25 years of experience in software engineering and product development. It employs over 1600 professionals located in 11 countries around the world.